Editor’s note: This is the first story in a two-part series. See the second story here. A small-town post office serves as a recognizable face of the local community. “It is an identity. Your ZIP code and your post office is your town,” said Brian Bauer, mayor of Mellette, S.D. It’s also the face of the federal government in the community, where federal holidays are observed and the flag is sure to fly at half-staff if directed so by Washington. But most of those buildings are not owned by the U.S. Postal Service—and relatively few of them are owned by entities with the same ZIP code as the one on the outside of the building. “We don’t have the capital to purchase” that many buildings, he said. Although most of the postal employees interviewed for this story declined to comment on the partnerships they have with private building owners, much of the information—including owner identities, addresses, rental rates and who is responsible for building upkeep—is public record and can be found at https://about.usps.com/who-we-are/foia/leased-facilities/report.htm. Whether a property is owned by a close neighbor or a distant landlord can have an effect on how much is charged for rent, as well as how easy it is to maintain the property, a Dakotafire Media analysis has found. 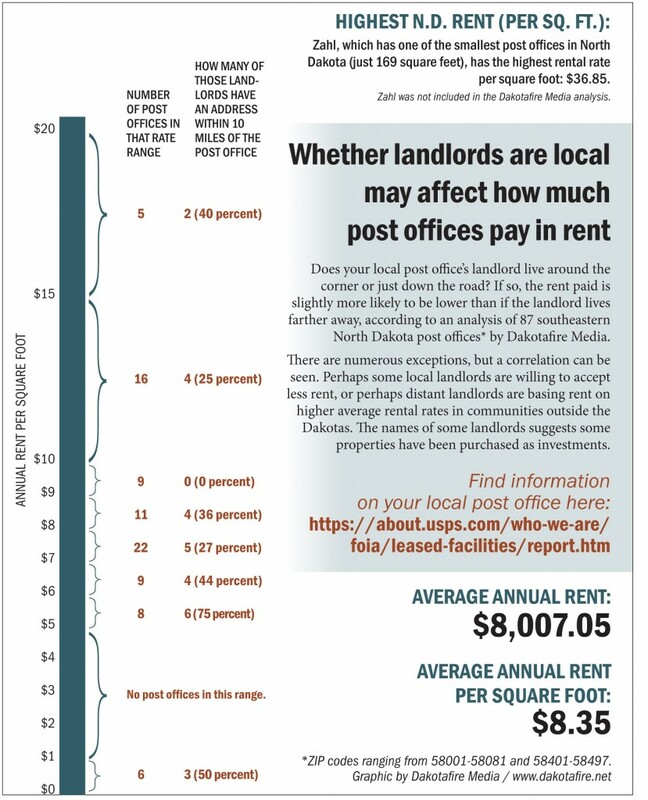 Dakotafire Media looked at data for 201 eastern South Dakota post offices (ZIP codes 57001-57481) and 87 southeastern North Dakota post offices (ZIP codes 58001-58081 and 58401-58497). About 37 percent of the S.D. post offices and 33 percent of the N.D. post offices were owned by a person or a business with an address 10 miles or less from the post office community. 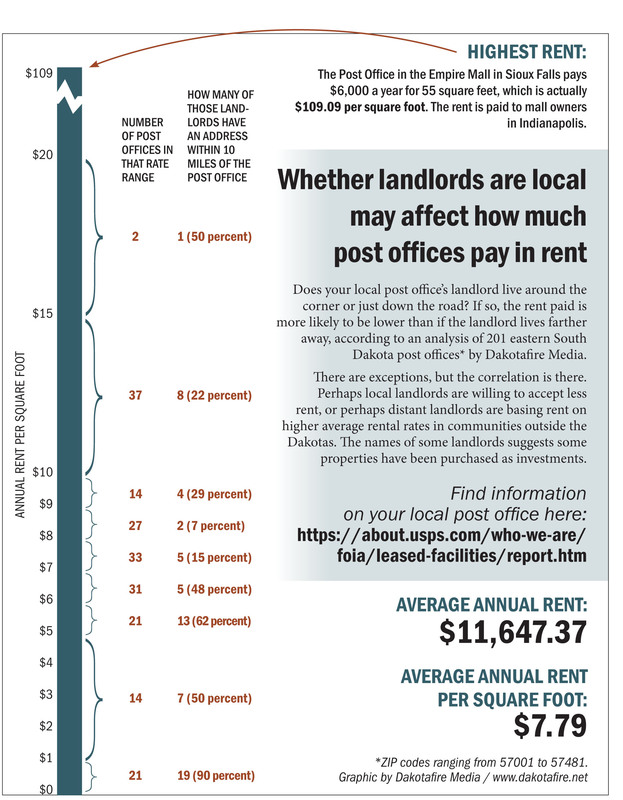 There was some correlation between the rental rate and the distance between the ZIP code of the post office and the ZIP code of the property owner: In general, the properties with rental rates lower than average were more likely to have a local owner. See more details on the infographics for North Dakota and South Dakota. Keeping a building up to snuff when an owner lives hundreds of miles and dozens of ZIP codes away—and in some cases has never seen the property—can be difficult. 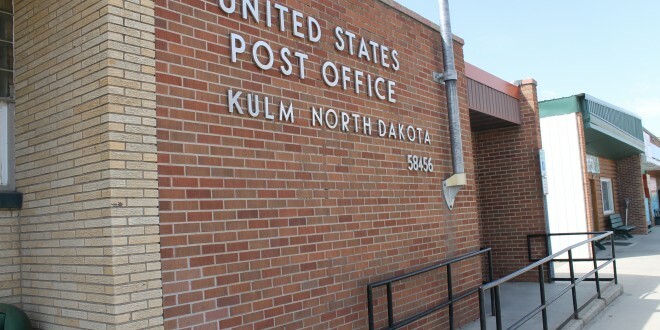 “They told me I’d never get a hold of the owner … I’m not allowed to contact him directly,” said Susan Ukaonu, a clerk at the Kulm, N.D., post office. Instead, she was told to contact the Postal Service with concerns, and it would forward the information to the building’s owner. Nowacki said local postmasters are responsible for communicating any facility-related issues to the USPS, as well as any issues reported to them by customers. Who is responsible for repairs varies by lease. In Kulm and Mellette, those responsibilities belonged with the buildings’ out-of-state owners. For years, the buildings in both communities had fallen into disrepair, and local postmasters said they had done their part. In Kulm, the problems were small, but added up to a big headache: broken light fixtures, poor sink drainage in the bathroom, a drafty front door. In Mellette, the problems were larger: Moisture had led to mold in the floor joists and peeling paint, and the building had shifted and become unlevel. In Kulm, once Ukaonu became the fulltime postmaster, she also became persistent, filing a formal maintenance request every few weeks. After a while, she received an unexpected call from Daniel Durick of Seattle, Wash., whom she’d assumed had cared little about the building that was bringing the family partnership, Dakota Grain Exchange, LLC, $9,192 annually. As it turned out, Durick previously was unaware of the building’s condition. “They made it sound as if I was being negligent,” Durick said, but he contacted a repairman from the Kulm area. Feeling the quote he received was out of line, Durick said he “decided it was worth my time to fly out there and fix it myself.” He arrived within a week of his initial conversation with Ukaonu. “If you’re a landlord, people have to be happy with the property, and you’ve got to take care of it. If there’s a problem, I want to know about it and be able to fix it,” he said. Darlene Visser of Gig Harbor, Wash., said she was under the impression that the building she and her late husband have owned in Mellette since 2004 was in overall good repair. They’d paid to have mold remediated, windows and air conditioner replaced and the lobby renovated to accommodate 24-hour box access just before she inquired with a local contractor about stabilizing the sagging structure, she said. The contractor told her the building was beyond repair, so she asked the USPS their take. She said she didn’t get a response until someone from Mellette contacted her, telling her trucks had arrived to remove postal fixtures. Shortly thereafter, she received a bill for three days’ worth of labor for the move. The situation was frustrating for local customers, too, who were given 24 hours’ notice of the closure. They now collect their mail at a “cluster box” in front of the old building and drive four miles to Northville, S.D., to conduct all other postal business. Because the Vissers couldn’t be contacted directly, local postal patrons’ hands were tied. “If it was (somebody) local, we could have made those repairs quickly, and they would have been back up and running, but it’s somebody from out-of-state, and they were dragging their feet,” Bauer said, adding that Visser and her son did not communicate well with the city. The city attorney sent an offer to demolish the building in exchange for the deed of the land two months ago. Visser had offered to move in a mobile home-like building valued at $19,000, but it did not meet city codes. Bauer said private ownership of property is good for the city’s tax rolls, but having “local control” of the facility is more important to Mellette, so the city was willing to pick up the tab to benefit local residents, as well as the community’s school, bank, butcher shop and South Dakota Wheat Growers facility. In Britton, S.D., local ownership has worked well. Longtime Britton businessman George Schott has owned the building for the past 40 years and receives an annual rent of $10,800. He recently invested about $14,000 in new lighting, flooring and other refurbishing, he said. “I think it’s important that the building look nice and that it is a good asset to the community,” he said. Running the business next door, Buhl’s of Britton, Schott is aware of maintenance needs before local postal employees could ever need to contact the USPS. And some out-of-state partnerships have stood the test of time. 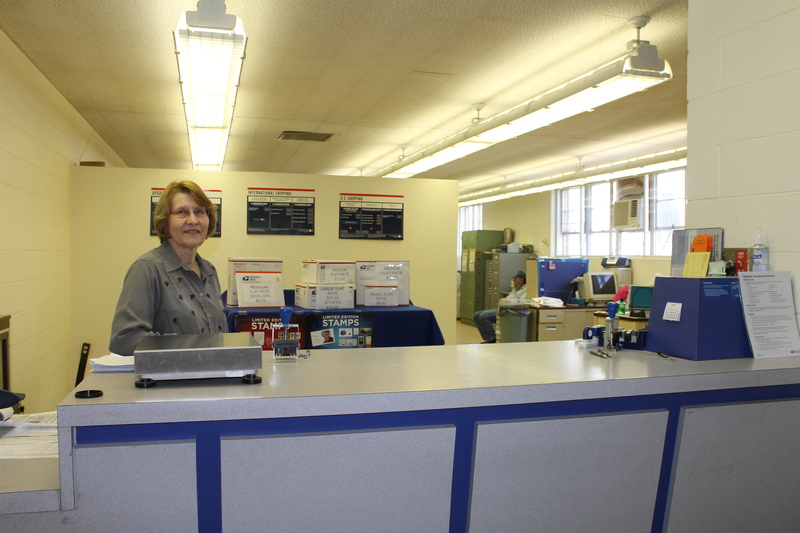 The Clark, S.D., Post Office has been owned by Nationwide Postal Management of Cedarhurst, New York, since 1962. Although many of the lease partnerships extend across state lines, some of those relationships were organically grown—Durick was raised in Columbus, N.D., and still owns farmland there and maintains several North Dakota friendships. His father purchased several post offices across the state in the mid-1950s, and he and his sister inherited the ones in Kulm and Columbus upon their father’s death. Durick described the miscommunications with Kulm that caused him to appear to be negligent as “upsetting,” and said future maintenance will not be such an issue. But for others, post office ownership is strictly business. Visser said she and her husband used to travel across the country, shopping for post office buildings. She still owns about two dozen postal buildings, and her husband managed as many more until his death. She said she thinks John Visser had, at some point, visited the Mellette building, although she never has. Visser said her location and other responsibilities—combined with difficulty communicating through the Postal Service—made responding to complaints cumbersome. In small towns especially, maintaining post office buildings that can stay open for generations is important. As long as the Postal Service is willing to budget the service there, the community is behind providing one. “If we continue to drag this out, they might just pull the plug on this altogether,” he said. Bids for Mellette’s new post office building are due Aug. 7, and negotiations with the USPS regarding a five-year rental agreement are upcoming. Already a four-hour-per-day facility, Bauer said the community is aware it still may lose its Post Office in the future, but it has a Plan B. Watch for the second story about post office ownership next week. Correction: An earlier version of this story had the wrong title for Susan Ukaonu. She is a clerk at the Kulm Post Office. The postmaster for the Edgeley, Jud and Kulm post offices is Miles Gehlhar.